You haven’t gotten around to it? It’s time to get A Round TUIT! Have you ever said something like, “I really have to start doing something to get back in shape. I just haven’t gotten around to it, yet.” or “I’ve always wanted to try a Martial Arts class, I just never got a round to it.”? 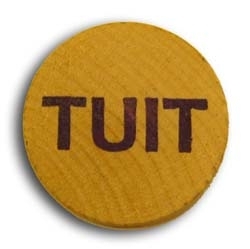 Well, as you can see I’ve attached attached a “Round Tuit” to the top of this post and at the risk of sounding a bit silly…now you have no more excuses. Seriously though, we hear people every day that have endless reasons (a.k.a excuses) for why they are physically inactive, overweight, out of shape, or just don’t like the way they look and feel. The truth is, no one has time to work out, everybody has important responsibilities such as a job, a significant other, a home to take care of, etc. I know one thing for sure though, if you wait for everything to be perfect in your life before you start training, you will never get started. The difference between the people that look and feel great because they lead an active, healthy lifestyle and those that don’t is simple. Active and healthy people have decided that they will MAKE time for themselves. They realize that ultimately, there is nothing more important than their health and well-being. Consider this: How effective can you be at your job or as a spouse or parent when you don’t feel your best? So now that you’ve gotten “a Round TUIT” isn’t it time you decide to make a change for the better? Give us a call, we specialize in beginners. April 8, 2010 Posted by NewProvidenceKarate | Martial Arts & Fitness	| 07901, 07922, 07928, 07974, Brazilian Jiu Jitsu, Cardio Kickboxing, Curves, Fitness Kickboxing, Jiu Jitsu, Karate Berkeley Heights NJ, Karate Chatham NJ, Karate Morris County NJ, Karate New Providence NJ, Karate Somerset County, Karate Summit NJ, Karate Union County NJ, Kickboxing Berkeley Heights NJ, Kickboxing Chatham NJ, Kickboxing Morris County NJ, Kickboxing New Providence NJ, Kickboxing Somerset County, Kickboxing Summit NJ, Kickboxing Union County NJ, Lifetime Athletics Berkeley Heights NJ, lifetime fitness berkeley heights nj, Martial Arts Berkeley Heights NJ, Martial Arts Chatham NJ, Martial Arts Morris County NJ, Martial Arts New Providence NJ, Martial Arts Somerset County NJ, Martial Arts Summit NJ, Martial Arts Union County NJ, MMA, Personal Training, Personal Training Berkeley Heights NJ, Personal Training Chatham NJ, Personal Training Morris County NJ, Personal Training New Providence NJ, Personal Training Somerset NJ, Personal Training Summit NJ, Personal Training Union County NJ, Tae Kwon Do | Comments Off on You haven’t gotten around to it?